They say knowledge is power – and in an emergency, information is the number one thing you need to Prepare – Survive – Thrive! How will my family/household get to safe locations in an emergency? When the Big One hits, you can’t afford to guess; you need to know. The first step is to build an emergency communication plan. It’s a great place to start, and you can do this online, but the main thing is that no matter how much stuff you have prepared, if you don’t feel that your loved ones are safe, or don’t know how to reach them or find them in an emergency, you’re gonna worry. Let’s do our best to make sure that doesn’t happen. If you have kids, there’s great resources here to get your emergency communication plan in place. FEMA also has a handy guide for a family communication plan. Something to help others know you’re ok is to register for the American Red Cross Safe and Well Website. Assume your cell phone won’t work. Even if it is working, pretty much everyone will be trying to get a hold of their loved ones. So the rule of thumb is, if the cell phones are working, don’t call, text. Assume your cell phone won’t work. If you’re one of those people who, like me, doesn’t remember anyone’s phone numbers, you’re in big trouble unless you take the most important contact numbers and write them down and carry them with you. So write them down and carry them with you. Assume your cell phone won’t work. Which means that access to the internet may be hard to come by, at best. You’re not going to get a hold of everyone right away. So focus on those closest and most important to you. The two most important pieces of information are “Are you ok?” and “where are you?” Yes, “what’s for dinner?” is important, but that’s for later. Have a single point of contact you use to send information. Its recommended to have this point of contact be out of state as long distance lines might work when local phone lines aren’t working, and if they are not affected by the disaster, they’ll have more time and resources to track everyone down and relay information. If you live anywhere there are rivers, bridges, overpasses, then there’s a possibility you may not be able to get to the other side, at least not right away. This is why it’s a good idea to have other points of contact to try and reach, especially if the phones go out. It’s also why it’s good to have one or more meeting places, so you know where to look for loved ones if you can’t communicate. 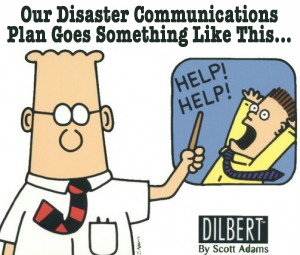 WeeSeeHSE has a great guide to building an emergency communication plan. Another thing to consider: Check with your employer, your child’s daycare center or school and even your church about their emergency communication plans. Not all organizations are as prepared as you would expect them to be. Take the lead if you have to and offer to create a plan for your office or your child’s daycare center. Most schools have plans in place and if you ask to see them, you should be able to get access. Talk to your child about the plans your school has and make sure he/she knows what to do if a disaster strikes. Know where to go, or who to contact to find out where your children are if they are evacuated from school. But wait! I wrote “assume your cell phone won’t work” three times. So how are you going to get information? Well, the first is old fashioned paper. One of the steps in the Map Your Neighborhood program is to place a sign on your door if you evacuate, letting people know where you’ve gone to. You can simply tell someone, like your neighbor, your boss, or teacher, where you’re going, so that if someone comes looking for you (they shouldn’t if you have a proper family emergency plan, but you never know) someone can tell them where you’ve gone to. Then there’s the radio. You can buy emergency radios, both battery powered and hand-cranked, and they’re important, because authorities will use the radio to provide information until power comes back on. Here’s a great article from LifeHacker about how to pick an emergency radio. And here’s a side by side top ten review of hand-cranked radios. You can get hand-held “walkie talkie” GPRS/GMS radios at a sporting goods or camping store. The downside is that if there’s an emergency and people have them, the shared frequencies may get jammed, that, and they have limited range. But if you’re only a mile or so away from your loved ones, they can help keep people in touch. You can get serious and obtain a HAM Amateur radio license. Which, frankly, you should. It’s actually really easy to get the basic technician class license, and even the more advanced licenses don’t require morse code anymore. These radios reach farther, much farther with repeaters, have far more usefulness, and they may be the ONLY way to get information in and out of a disaster area when the big one hits. My ex wife got her licence while 7 months pregnant with our daughter, in the heat of August, so it’s something you can do, too. Plus if you join a local amateur radio service, they can teach you how to send messages for others and help emergency responders, too. 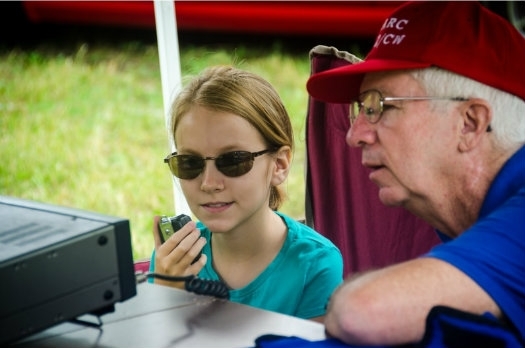 Amateur radio licenses have no age restrictions, and in 2011 an 8 year old girl passed the HAM radio operator test!! The ARRL has all the info you need to learn how to get licensed. Not every emergency is the “Big One”, and so maybe, if it’s just a windstorm, or an ice storm, or a flood, or something where my cell phone DOES work, what then? Well, many cities and counties have really cool automated emergency alert systems that send you text messages or push notifications. Just Google Emergency alerts and your zipcode and the opt-in alert system for where you live should show up in the results. FEMA also has a website for emergency alerts and warnings.